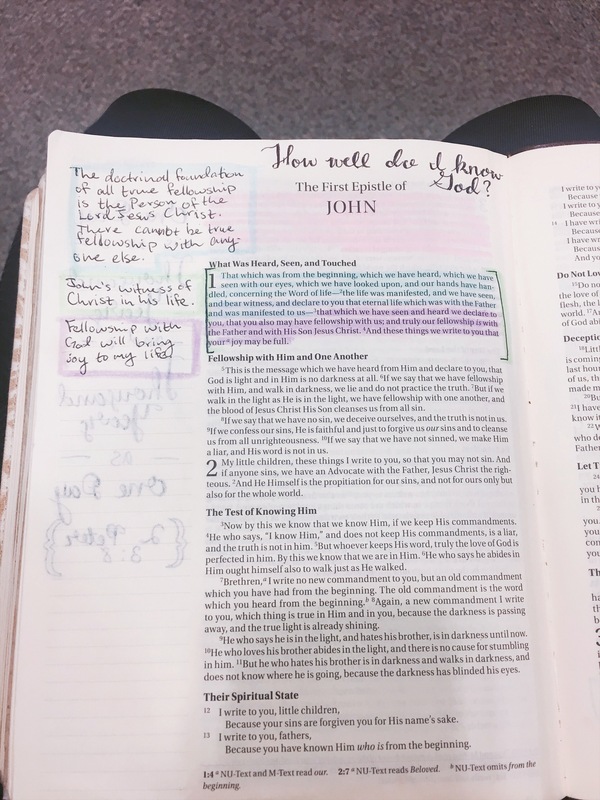 My bible study notes and a calligraphy design behind the page. One of the most common things you’ll here in a bible study is your fellowship with other believers and how it is so important that you have other believers in your life who will encourage you and exhort you and be that “as iron sharpens iron” friend. Well this past Sunday my sister and I did worship for the youth group and during the service the youth pastor asked a simple question at the end of his study: “How well do you know God?” During the service I brought out my Believer’s Bible Commentary by William MacDonald on my iPhone in iBooks (isn’t technology great?) I began to analyze verses 1-4 of 1st John 1. These verses showed the reader John’s witness of Christ in his life. John, as one of the 12 disciples, was blessed enough to not only here about God coming down to earth as Jesus Christ but he was also able to see Jesus, touch Him, and have fellowship with Him. John writes about how when he is sharing the gospel with the people he meets, he is then in fellowship with them and the people are also in fellowship with God Himself. He goes on to share that our fellowship with God will bring joy, a joy that will fill our entire being; this joy can only be experienced when Christ is living in and through us. John’s constant fellowship with God showed him how much God cared for him. God, the Creator of everything, had a desire to have a personal relationship with John who, even though was part of the 12 disciples, was also a rotten sinner like the rest of us. This fellowship with God continued even after Jesus descended to heaven. The fellowship that John had with God brought him great joy that he knew he must share with the world till the day he died. Now, how well do you know God? From what the Lord has shown me and is still showing me is that He is my ultimate comforter. Through His word He shows me what I need to hear rather than what I want to hear. He puts things in my life that keep me close to Him. God constantly reminds me that I am not in control of my life, which is a good thing because my life would probably be really messed up if it wasn’t for the Holy Spirit directing my life. I may not be able to see Jesus face to face like John did but I have faith that I will see Him one day because I feel His presence within me and I can see Him in every good and holy thing in this world. And that is enough for me to know that there is a God who looks out for me and you. A God who knew that even when He created Adam and Eve they would fall into sin yet He would still love them any way. He continues to love us even with all our faults. I know this because I have fellowship with God. I won’t say that it is true fellowship with God because I still have struggles in my life that I need to work out, but I have faith that God will meet me right where I’m at and continue to help me withstand the devil and his plan to hold me captive to my sin. The fellowship I have with God has revealed this all to me and much more.